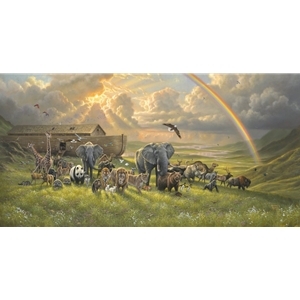 When I was commissioned to paint Noah's Ark, I was at first intimidated by the daunting task of trying to capture such an epic explosion of renewed life on canvas. In reverence for the subject, I waited until I felt the inspiration and had no limit on the time I needed to devote to it. This painting holds a deep personal significance for me in my life, and I'd like to share it with you. We all experience vicious storms and we can get flooded and overwhelmed by all that this life throws at us. During these times we must be like Noah, and remember that God knows the days of darkness and storm, and that these times make us even stronger and more grateful for the light. In this painting, the storm is finally over. The waters are receding, and the light is breaking through and pushing the dark clouds away. Along with the burst of life on earth, the animals are set free from the confines of the Ark, and race into the cleansed new world. Noah stands in the door, saying goodbye to his feathered and fury friends that he faithfully saved and protected. In the center stage of the painting, the doves, lions, and lambs remind us of the Spirit that is always there to comfort us, and the day when there will be such peace on earth that the lion will lie down with the lamb. I want to invite you to enter in to this painting. Rejoice in the sign of Gods promise. Breathe in the flowers and fragrance of new life. Find peace that the storm is over. Find hope in your life having A New Beginning.